A bond that can be converted into a predetermined amount of the company’s common stock at a substantial premium to its market value, at certain times during its life, usually at the discretion of the bondholder. A bond with a stock call option hidden inside. Offers lower yield on the bond in exchange for optionality to convert to equity if underlying rise. 1. 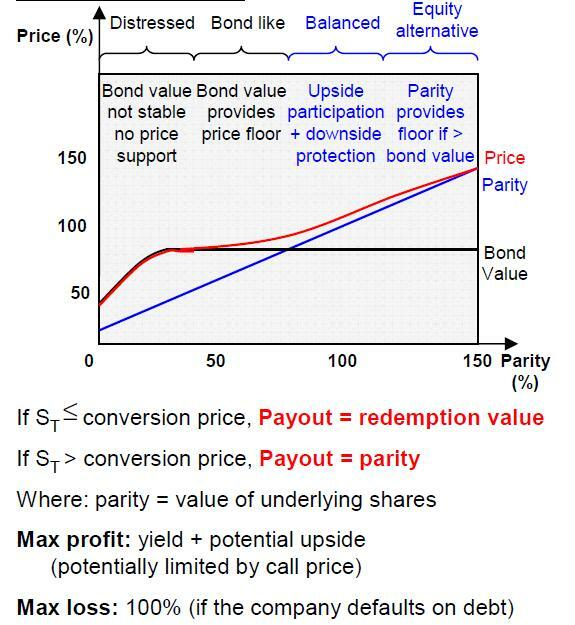 Bond value: affected by credit spreads, interest rates, investor puts and issuer calls. 2. Option value: the time value of embedded option to convert and affected by volatility expectations, strike, parity, issuer call, interest rate, dividend. 3. Parity: the value of underlying shares if investor converts and affected by underlying share price, adjustment to conversion teams during issue’s life and FX changes. 4. Yield advantage: yield of convertible – dividend of underlying share. Used by hedge investors to extract value from any cheapness in the convertible’s option or seek to gain value from tightening credit spreads. Used by equity investors that seek yield advantage and downside protection from the low cost put option. Used by outright convertible investors that prefer balanced convertibles on stronger credit names, which give exposure to parity rises, along with downside protection from stable bond value. Used by balanced funds with a diversified portfolio. Used by fixed income investors looking for higher spread compared to straight debt, with upside potential from the low cost embedded option. Used by distressed funds that will invest in convertibles either as they believe the company will negotiate through the current difficulties or in order to participate in a debt for equity swap. Downside support with upside participation. Investors could delta-hedge via shorting stock, which leaves them with long gamma position that will gain as volatility goes up. Meanwhile a return from risk-free interest rate plus credit spread is guaranteed from the unhedged portion (bond).